- Modern UI with animations. - Choose your images: colored or not. - Notifications in the Lock screen. - Export data to csv file (full version). - Low charge notifications (full version). - Secondary live tile (full version). - Charts: from daily to all history (full version). - Data backup/import (full version). - The live tile and the lock screen can be updated approximately every 30 minutes. - The live tile and the lock screen can show percentage from 0 to 99. - The notification icon in the lock screen can't change. - Battery saver mode can disable the background agent. - The background agent sometimes doesn't work in airplane mode or without internet connection. All applications seem have this problem. 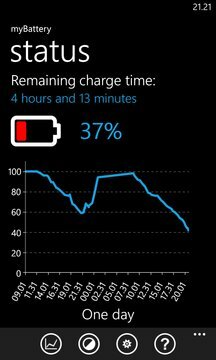 - The battery at 100% is not visible in the lockscreen (see Windows Phone limitation #2). 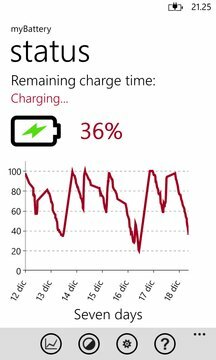 "This app don't drain battery": when the app is closed, the background agent works approximately every 30 minutes and only to get battery informations. If you have drain battery issue, check the others applications. If you have any problem, don't write a bad review, but contact the support. Help me with the language translations please. - Check your battery level on the lockscreen with the new application "myBattery Lockscreen"